Aveso are no strangers to local and national media and have featured in the news a number of times as a result of successful high profile installations and assisting with campaigning. As Changing Places are such life changing facilities for thousands of families, the team here at Aveso would like to share just a few highlights from projects we have had the pleasure of being involved with from our time as official Changing Places campaign sponsors so far. Following a nightmare trip to see One Direction at Murrayfield where there were no suitable toilet facilities for teenager Kelsey who suffers from profound and multiple disabilities, her family decided to take action and start the ‘Loo Tour De Britain’ to cycle approximately 300 miles to raise over £10,000 for a Changing Places in their home town in Arbroath. The tour helped raise vital money and the new Changing Places was opened in August 2015. It was great pleasure for Aveso to help with the supply of the Mobiloo mobile Changing Places unit for the official Why Not People launch event in July 2015 which was a truly accessible gig which was hosted by broadcaster Jameela Jamil and supported by singer Tinie Tempah. Aveso were interviewed live on air as part of a BBC Radio Gloucestershire Changing Places discussion in April 2015. 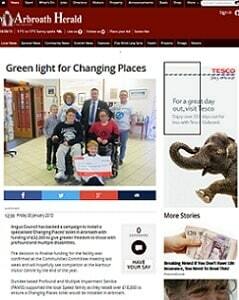 As the Changing Places Campaign is growing, the discussion centred around the lack of facilities in the area. Aveso proudly sponsored the ‘Access for All – Unlocking The Purple Pound’ event which was organised by Visit England and held at Sandcastle Waterpark in March 2015. The event took place over 2 days to give accessibility advice and help for tourism decision makers and local businesses. The event followed with a ‘think tank’ made up of the leading accessibility experts in the UK including Aveso. As a result, we are pleased to be a key member of the newly formed ‘Accessible England’ group. In February 2015, Aveso invited campaigners and supporters to finally meet each other at the very first official Changing Places Conference held at Chesterfield FC. Everyone had the chance to celebrate joint success and Aveso said a big thank you for their hard work and dedication. Aveso arranged for industry experts and key campaigners to speak about their journey and how we can all support each other moving forward. Jane Carver from Accessible Derbyshire said: “When you are out there on your own campaigning for change it can sometimes be a lonely journey so to be in a room full of so many like-minded people felt wonderful! Following the success of the Changing Places facility at Arsenal FC’c Emirates Stadium, Aveso were approached by the team at Liverpool FC who wanted to increase the accessibility of Anfield. In November 2014 Aveso were proud to be able to supply a mobile changing bench in their team colours, something which only Aveso are able offer! The vice chair of the LDSA commented that he hopes the club’s new Changing Places facility will be a flagship for all football grounds across the country. Aveso were delighted to help the Emirates Stadium become the 600th registered Changing Places in the UK making Arsenal FC the first Premiere League football club to have fully accessible toilet facilities for their disabled fans. The facility was installed April 2014 and opened by Alex Brooker form Channel 4’s “The Last Leg” and 2012 Paralympic Games and gained much media attention as a result. Following the opening of the Changing Places toilet, Arsenal’s home ground was able to host the UK’s biggest ever conference for people with autism and learning difficulties ‘100 Voices’ run by the Brandon Trust.